When you're done reading this guide, you'll understand everything there is to know about what pool shock is, why you need to shock your pool, when to shock your pool, how to shock your pool, and the different types of pool shock to use. Best of all: it's REALLY easy to do and will keep your pool clean and algae-free. In a minute we'll get to all the facts about pool shock, what it is and why it’s important, but for now it’s time to get down to business and get this job done. Here's how to shock your pool in six easy steps. Pool shock can harm your skin and bleach your clothing, so make sure you wear clothes you don’t mind ruining, and gloves and protective eyewear. 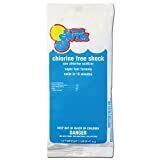 Once you’ve chosen your pool chlorine shock, you'll need to read the manufacturer’s instructions and prepare it accordingly. 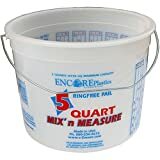 For example, granular shock will usually need to be dissolved in a five-gallon bucket of water before it’s poured into the pool. But other shock, such as lithium hypochlorite can be poured straight in. You'll also need to determine the proper amount of shock to use with your particular size of pool and prepare it accordingly. Poor the shock and water solution into the pool according to the manufacturer’s instructions. Some will recommend you disperse it evenly around the edges and others will tell you to pour it in close to the jets to circulate it. Leave the chlorine shock in the pool water to do its work. The manufacturer’s instructions are important here as well to make sure no one gets in the water too soon after treatment. It’s usually recommended that you leave it overnight. After you’ve waited the recommended number of hours, you still need to test your pool’s chlorine levels (pH, total alkalinity, and calcium hardness especially) before letting anyone swim. Make sure the levels have returned to normal before you allow anyone in. Note that low pH levels are important here: if your pH level is over 8.0, your pool shock is basically useless. Shoot for a pH level of around 7.2 if you need to lower it. While shocking your pool will help kill any germs any algae, it won't actually get rid of them; for that, you need your filter. So be sure to run your pool filter for at least 24 hours. The process of shocking your pool is simply super-chlorinating it in order to kill the buildup of chloramines and anything else floating around that doesn’t belong. What are chloramines, you ask? Chloramines, or combined chlorine, are what get into your pool when chlorine disinfectants combine with the sweat, oils and (yes) urine from the people swimming in your pool. So when you shock your pool, you're adding enough chlorine to destroy the chloramines. Whether you're a brand new pool owner or a veteran, you need to be familiar with the process of shocking your pool. Certain living organisms can still survive in your pool with its normal chlorine amounts. Others can become completely immune to it. Sunshine breaks down your chlorine, causing it to lose up to 5 ppm per day. Swimmers are constantly bringing in contaminants like makeup, sweat and bacteria that normal chlorine levels can’t always fight. Most people only decide to shock their swimming pools when they see an overgrowth of algae or they start getting cloudy pool water, but by this time, cleaning your pool could take a lot more work. So if you stay on top of this chore by shocking your pool once a week, you may be able to avoid an algae overgrowth. This kind of contamination often requires way more scrubbing, vacuuming and sometimes even draining than you will ever want to do. Let's first talk about the differences between free chlorine, combined chlorine, and total chlorine. Free chlorine: The chlorine that's actively cleaning your pool, "free" to do its job. Be sure to use cyanuric acid to stabilize the free chlorine. Combined chlorine: This is the chlorine that while technically still in your pool, is mostly "used up" and not able to clean your pool. High levels of combined chlorine mean there is less free available chlorine to do its job. Total chlorine: This is simply the sum of free chlorine + combined chlorine. Generally, the goal is to raise your free chlorine to about 10x the level of the combined chlorine (commonly know as "break point chlorination). 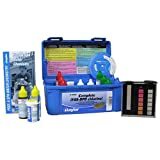 Most pool test strips won't be able to measure combined chlorine and total chlorine, so you'll have to use a pool test kit to do this job. When your free chlorine levels drops below 3 ppm, it's time to shock your pool. Your pool definitely needs a pre-boost of chlorine before everyone starts jumping in with all their germs. It’s especially important if you’ve had a cover on all winter. Who knows what might be lurking under there? 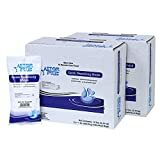 If you are about to close up shop, there could be algae spores or other matter in there just waiting to make a home in your crystal clear water. Get ahead of it by killing it before it grows! Heavy wind or rain can carry in debris and algae spores that can get out of hand quickly if you don’t take charge immediately, and can also cause a significant water level change. Did your kids recently have a pool party? All kinds of icky junk can be transported into the water by humans and pool toys. Get rid of that leftover sweat, makeup and who knows what else before it clouds up your water. Algae spores can bloom and spread quickly. Don’t let your pool get overtaken before you take action! There are several different types of pool shock on the market and it’s important to know the difference before you decide which one is right for you. You can pick any of these up on Amazon or at your local pool store. Calcium hypochlorite is usually granular and also sometimes called cal-hypo shock. This is the most popular shock purchased because it’s considered the strongest and it’s also the cheapest. It dissolves quickly and should be used at night because it’s adversely affected by sunlight. Lithium hypochlorite is usually used in pools with high calcium levels because it doesn’t contain calcium itself. You don't have to pre-dissolve it, making it slightly more convenient than other shocks. This is a granular chlorine that dissolves slowly, so it’s cleaning power lasts longer than cal-hypo. 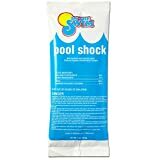 It has a neutral pH level and is another highly popular pool shock because of its availability. However, be aware that DiChlor shock can cause your cyanuric acid levels to rise. Popular with vinyl liner pools, this shock is oxygen-based instead of chlorine-based, and it oxidizes the pool water and boost chlorine levels. People can actually swim very soon after this treatment is applied so it’s a popular shock to use in between super-chlorinating during heavy swim times. Q. What's the best time of day to shock? Most pool shocks are best used at night so that the sunlight doesn’t decrease its effectiveness. It’s also best to shock at night so that it can be left alone for several hours, giving it time to work. Q. How long does it take to shock a pool? The actual process shouldn’t take more than an hour, but depending on the product used, it could be up to 8 hours before you can use it. Q. How long after shocking is it okay to swim in? When using a chlorinated shock such as dichlor or cal-hypo, you will need to wait the recommended amount of time before swimming, usually overnight. When using a non-chlorinated product, however, it’s usually safe to swim after about 15 minutes. After the pool shock is added, pool toys and accessories can also be thrown in for decontamination. Never add pool shock directly to the skimmers. Keep the pool uncovered until chlorine levels return to normal. NEVER swim before checking to make sure the chlorine levels are at 3 ppm or less. Use the entire amount of shock necessary for your pool’s size. Don’t use shock on windy days. The product needs to stay in the pool, not in your face! Shock your pool once a week to keep contaminates and algae from becoming a problem. You can brush your pool after shocking to distribute chlorine more evenly. Nobody likes a dirty pool. Take it from me—if you shock your pool once a week, it will save you HOURS of cleaning time in the long-run. Killing algae spores and bacteria before they spread is the number one way to stay ahead of pesky pool maintenance tasks once and for all. So, don’t neglect it. Shock your pool on Monday and enjoy it the rest of the week!